Deferment vs Forbearance: What's the Difference? Struggling with loan payments? Understand how postponement options work. Two options to consider are deferment and forbearance. These options are available for Federal student loans. Your private student loans may have postponement options. You may know that student loans start off in standard repayment. Standard repayment is your loan amounts divided by 10 years plus the interest. What if you can't afford this? What if you decided to go back to school? Did you get sick one semester and had to leave? Whatever may have happened, a deferment or forbearance may help. To learn the pros and cons of deferment and forbearance, read on. Deferment and forbearance allow you to stop paying your student loans for a period of time. With a deferment on a subsidized loan the government will pay the accrued interest during the time your payments are deferred. With forbearance your interest will continue to accrue. Being a student loan borrower is tough. You may have to make several payments. Chances are your first paycheck is smaller than expected. The average loan payment is $350. 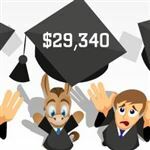 The average student debt hovers at $37,000. Making payments can be difficult. A deferment will postpone your student loans for six to 12 months at a time. You have 36 months throughout your loan repayment period for deferments. In a deferment, the federal government covers subsidized interest. You are responsible for the interest accruing on unsubsidized loans. A forbearance postpones your student loans for 12 months at a time. But you'll be responsible for the interest that accrues on all loans. Any unpaid interest will capitalize on your loans. With a forbearance, accrued interest will add on to your principal balance. For example, assume your principal balance is $40,000. A six-month forbearance equals $500 accrued in loan interest. Your new balance is $40,500. Any time that you use a forbearance, this will be the case. The length and interest rate will vary, but the same concept will apply. Who Do I Request a Deferment or Forbearance From? The National Student Loan Database System, NSLDS, may help. Or you can call the Department of Education at 1-800-621-3115. Don't ignore your loan servicer. Your servicer wants to help you. Ignoring student loan payments will cause your loans to enter default. Default occurs at 270 days past due. At 360 days past due, your loans enter collections with the DOE. They may transfer your loans to an agency. Or speak with your loan servicer. Why Would You Choose a Deferment? A deferment is great to delay payments. Is your enrollment at least half-time? Are you entering a Graduate Fellowship Program? If you find yourself unemployed, you can postpone your loans. Or are you experiencing economic hardship? Are you in the Peace Corps or serving on active duty in the military? Options are available for programs for disabled persons. Contact your loan servicer if you're struggling with payments. Why Would You Choose a Forbearance? A forbearance is good if you need to postpone payments. The two types are general and mandatory. A few questions to determine if and which forbearance is best: Are my current financial issues temporary or long term? Will a deferment be able to help instead? Am I able to cut expenses? Your loan servicing company will determine a general forbearance. You may use a forbearance at times of financial difficulties. Did you incur excessive medical expenses? Change in employment? Your loan servicer may find other acceptable reasons for a forbearance. A mandatory forbearance is great provided you meet the requirements. Your degree may need an internship or a residency program. Member of AmeriCorps a forbearance another option may help. In the National Guard another option may help. Eligible for Teacher Loan Forgiveness? Apply for the Teacher Loan Forgiveness Forbearance Request. Why Shouldn't You Use a Deferment or Forbearance? The cons for both options are similar. Using these options without need will add to your loan terms. This will increase the amount that you must repay. Interest will add onto all loans in a forbearance. Interest accrues on unsubsidized loans in a deferment. If you can make payments, call your servicer and cancel right away. This way you can get back into making payments without added interest. You can postpone private loans. The options vary from federal loans. Speak with your private student loan servicer. Private loan companies may offer deferments or a forbearance. Enrolled at least half-time? Other reasons your loan company may help are financial hardships. Are you unemployed or under employed? Are you an active duty military member? Most of these forms are on your loan servicer user dashboard. Requirements for private loan postponement may differ from federal loans. The best thing to do is speak with your servicer. Federal loan deferments and forbearances won't apply to private loans. Not Eligible for Any of Those Options? Remember that the federal government wants you to repay your student loans. If you struggle with payments, use the above options. Postponing payments without reason isn't wise. You will extend the amount of time and add unwanted interest to your loans. Both options have 36 months available. Used both options? You may be eligible for other postponement options. Have you considered income-based options or student loan forgiveness? Are you eligible for any grants? Aren't eligible for any of those? Consider refinancing or consolidating your loans. Consolidation is for federal student loans. The process takes your existing loans and turns them into a new loan. You will have a new payment and interest rate. This interest rate isn't credit based. Your interest will be the weighted average of your current interest rates. You can complete the application for free. Do you have a great credit score or a credit worthy co-signer? Refinancing is great to lower rates on your loans. 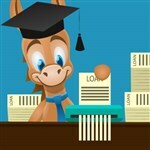 Private loans may have been a necessity for your degree. We get it, you weren't in a great place with your credit. If you apply, you may be able to get a lower rate. Remember your servicer wants to help. Your servicer has a contract with the federal government. They will assist you in repayment. Contact them with any questions or concerns. Share on Facebook "Deferment vs Forbearance: What's the Difference?"